The terms in II are like terms. This is because these terms have the same variable x2 and y3 even though both variables are written in a different order. The terms in III are unlike terms. This is because these terms have variables with different exponent (i.e. power). The terms in IV are like terms. 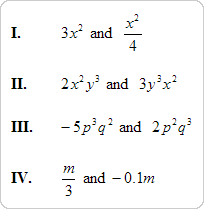 This is because both terms have the same variable m.
The terms in I, II and IV are likes terms. Clearly, the answer is C.